You are purchasing a limited edition of 250, Walt Disney Imagineering (WDI) pin, featuring Villains. You will receive the pin in good condition, with very minor wear and tear. Pin was released and is no longer available. Original photograph is of actual pin you will receive and is private property of My-D Pins and Collectibles. Don’t miss out on this pin! We apologize for the inconvenience. 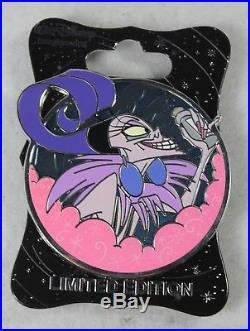 The item “Disney WDI LE 250 Pin Villains Profile Yzma Emperor’s New Groove” is in sale since Monday, July 9, 2018. This item is in the category “Collectibles\Disneyana\Contemporary (1968-Now)\Pins, Patches & Buttons\Theme Parks\Disneyland/DCA”. The seller is “mydpins” and is located in Anaheim, California. This item can be shipped to United States, Canada, United Kingdom, China, Mexico, Germany, Japan, France, Australia, Denmark, Romania, Slovakia, Bulgaria, Czech republic, Finland, Hungary, Latvia, Lithuania, Malta, Estonia, Greece, Portugal, Cyprus, Slovenia, Sweden, South Korea, Indonesia, Taiwan, Thailand, Belgium, Hong Kong, Ireland, Netherlands, Poland, Spain, Italy, Austria, Israel, New Zealand, Philippines, Singapore, Norway, Saudi arabia, Ukraine, United arab emirates, Qatar, Kuwait, Bahrain, Croatia, Malaysia, Chile, Colombia, Costa rica, Panama, Trinidad and tobago, Guatemala, Honduras, Jamaica.